It really does feel nice, if you actually can spend time and just roam around instead of just having 2 to 3 hours to create and work in SecondLife. First I started to unpack a lot of boxes, which came too short over the past few weeks because of the final exams at school and all the events that come for the end of year of school. My first box already had something very cool in it… the new “Ride” outfit from [sys]. The whole outfit contains a bra, shirt, shorts and a wrapped shirt around your waist. There are different color combinations available but each one comes with a HUD to customize it a little more. You get 2 options per HUD for each part. While I was opening all those boxes that got to me over the last couple of weeks I found one goodie after another, what means, there will be a lot of posts over the next few days o guess ;). Another amazing item, which perfectly matched the “Ride” outfit from [sys. ], was the “Equals” tattoo from White Widow. That awesome art piece covers the arms all the way down with flowers in wonderful shadings. Now certainly I needed some cool glasses, which I found at Haysuriza – A place I really love to go if I need some cool, more urban casual looking glasses ;). Saying that, my jewelry for today comes from YS&YS and has quite some years on it’s back in my inventory 😉 The “NEW Silver” set with a part flexible earing and the wonderful necklace just made the perfect addition for the look. 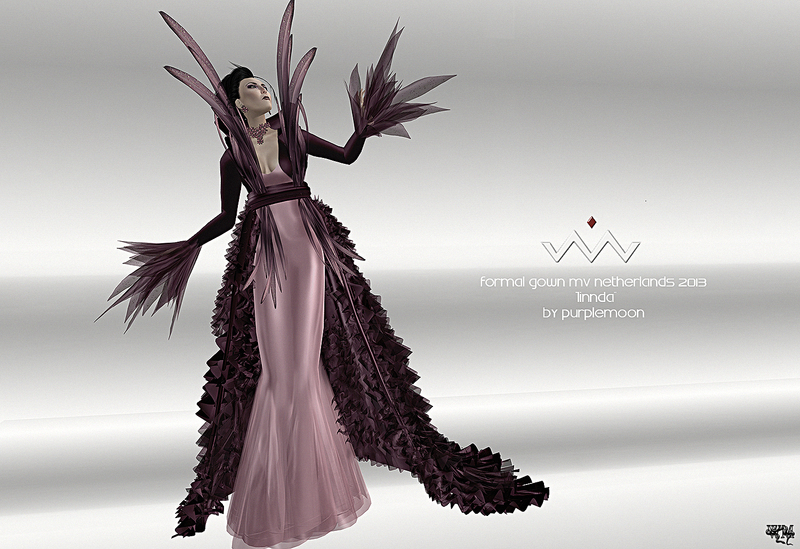 The wonderful and elegant formal gown for Miss Netherlands 2013, Linnda Scofield, was mae by Poulet Koenkamp, owner and designer of PurpleMoon. The soft pink and darker shade of rose make a very sophisticated look. With the huge prims that go up and down from the waist, the whole gown gets a light artistic look as well. The wonderful ruffles of the train together with the long wrist prims make the perfect look for the Miss Netherlands 2013 evening gown. The next national costume I would love to show you is made by GizzA for the Miss V Netherlands 2013, Miss Linnda Scofield. I have to admit as I saw this outfit during the MVW 2013 finals, I had to look 3 times as I could not believe what I saw… The “Linnda’s Dutch Breeze” is more a piece of art than an outfit for me. Linnda was pulling a whole meadow behind her with some super cute windmills on it. The dress itself has great color changed from the top to the bottom. It starts with a red chest part. Its prims reminded me of the typical tulips that we all know for the Netherlands. It turns green like the down part of a tulip and then the great meadow starts that finished in a wonderful brown tone. For me it really is a wonderful design that perfectly represents the Netherlands and a lot of its typical symbols.